Dining In made Alison Roman’s SALTED BUTTER CHOCOLATE CHUNK SHORTBREAD Instagram-famous, but in fact all the recipes in this most-talked-about and of-the-moment cookbook are just as much of a source of inspiration. With 125 recipes for effortlessly chic dishes that are full of quick-trick techniques (think slathering roast chicken in anchovy butter, roasting citrus to ramp up the flavor, and keeping boiled potatoes in the fridge for instant crispy smashed potatoes), it’s no wonder Dining In has been dubbed a “treasure map” (Samin Nosrat, James Beard Award-winning author of Salt, Fat, Acid, Heat). Roman's recipes—vegetable-forward with quality ingredients, punctuated by standout flavors like hot honey browned butter, preserved lemon, za'atar, and garlicky walnuts—have set today's trends and are already establishing themselves as classics thanks to her devoted social media following. Her ingenuity seduces seasoned cooks, while her warm, edgy writing makes these recipes practical and approachable enough for the novice. Cooking through Dining In is the next best thing to having Alison right there with you in the kitchen: brash, funny, and full of opinions. ALISON ROMAN is a contributor at Bon Appétit and The New York Times. Her work has been featured in GQ, Cherry Bombe, The Cut, and Lucky Peach. The author of Dining In and Lemons, a Short Stack Edition, Alison has worked professionally in kitchens such as New York's Momofuku Milk Bar and San Francisco's Quince. A native of Los Angeles, she lives in Brooklyn. 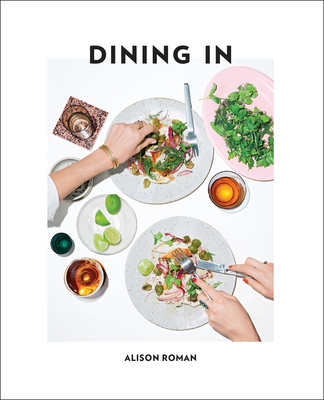 "Like your best friend who’s a great cook, [Alison Roman] spends a lot of ink up front persuading you that, yes, you can do this, you can cook. And as your best friend, she speaks to you in a conspiratorial tone and keeps things easy. Her recipes rely less on tricky technique than on clever flavor and textural combinations. Everything seems thrown together in a breezy manner, but the genius is evident… Every recipe seems “highly cookable,” her catchphrase, and craveable. And any chef who admits she likes black olives from a can “that you can wear on your fingers” is someone we’ll follow into that kitchen. Best Cookbooks of 2017—KCWR's "Good Food"